Rust stains that come from lawn fertilizers, hard water, patio furniture, irrigation systems or even battery acid can really ruin a great looking home. Rust stains are almost impossible to remove without damaging the concrete itself – unless you have the correct cleaning solutions and procedures that work on the concrete surface you are cleaning. Fortunately, these stains can be removed at a fraction of the cost of repainting a house, or of expensive driveway coatings that can peel over time. To resolve your ‘rust stains’ yourself, you might try products that are sold in the box stores, but they may not have been formulated for your particular stain. As an authorized F9 BARC applicator, License to Wash has invested effort to learn how to effectively remove rust stains from a variety of surfaces, including everything from concrete to glass. Any time that you have metal in contact with concrete, it will eventually start to rust and leave those unsightly rust stains behind. Many untrained contractors recommend that you use muriatic acid for stain removal, but we know that this actually dissolves the concrete surface, often without even removing the offending stain. Professional rust removal products such as F9 are not the same as the ‘Professional Strength’ cleaners that are available to consumers; they are only sold to trained rust stain removal contractors, like License to Wash.
License to Wash has the right products, and the skills to use them! 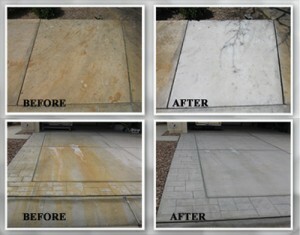 The fertilizer that you apply to your lawn is also a major culprit of rust stains on concrete. 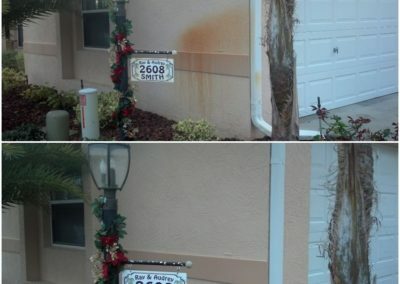 Fertilizer rust stains are even harder to remove than normal iron stains because of the makeup of the fertilizer. Our cleaners and process can even get out the toughest of these stains. You may also be dealing with stains from battery acid, such as drips from a golf cart battery. These are very difficult to remove, and you may have given up trying! You’re in luck, License to Wash has the skills to remove those tough stains. 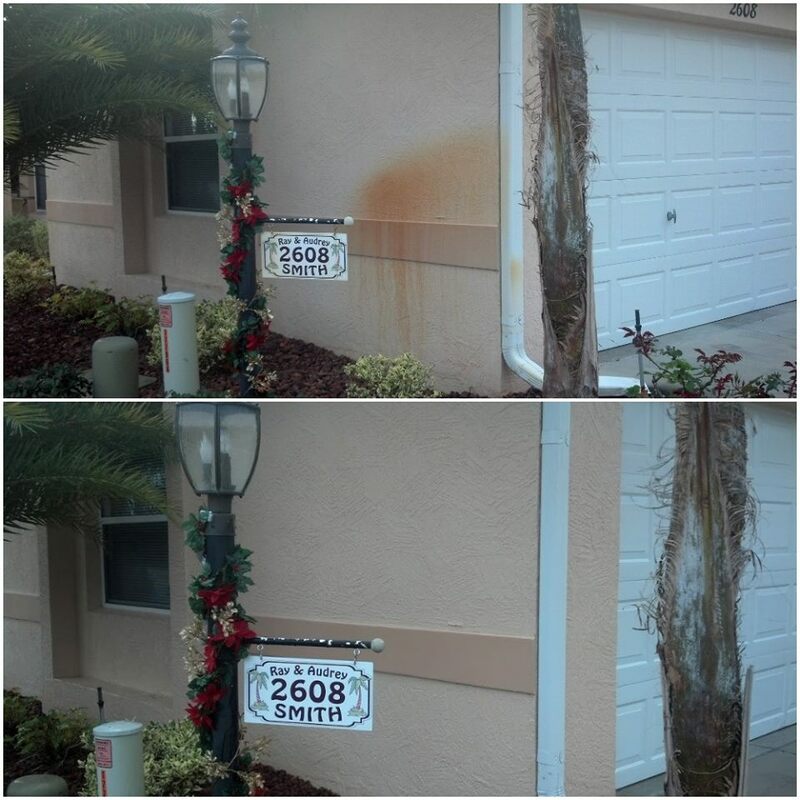 Give us a call TODAY for a free quote for rust stain removal.